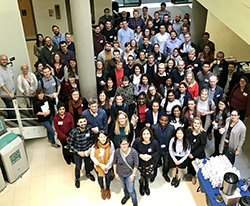 On 13-14 September, the University of Warwick hosted the 5th annual M4 Midlands Microbiology Conference organised jointly by Dr Freya Harrison, Dr Yin Chen and Profesor David Roper in SLS as well as Dr Meera Unnikrishnan, and Dr Chrystala Constantinidou, from WMS. The conference attracted over 140 participants from throughout the UK with outside speakers from the Pasteur and Karolinska Institutes, and featured a wide breath of microbiology from environmental phage biology to the influence on the bacteria cell wall in host physiology. Microbiology research at Warwick featured prominently at the conference including poster prize winner Carmina Micelli as well as the Antimicrobial Screening Facility which is a unique facility in the area supporting academic and industrial requirements. The conference was sponsored with generous support from the Microbiology Society, The Company of Biologists and Society for Applied Microbiology as well as a number of exhibiting companies.